Frank Johnston left Toronto in 1921 to take a post as principal of the Winnipeg Art School and director of its art gallery. By 1924, Johnston had formally left the Group of Seven, desiring to follow his own path, and had even renamed himself Franz to claim his individuality. While in Winnipeg, he took frequent expeditions to the surrounding landscape and further across the Prairies, traveling as far as the Rocky Mountains. Consequently, some "western" subjects show up in his oeuvre, such as the 1925 oil entitled Cowboy Camp, Sundown, Lake Louise, in the collection of the Art Gallery of Ontario, and this atmospheric painting. 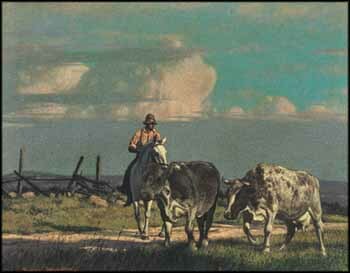 Johnston had a keen eye for a picturesque subject, and here he sets the cowboy rounding up cattle against a magnificent backdrop of lofty cumulus clouds tinted by soft pastels that float in a glowing turquoise sky. In The Stragglers, Johnston shows his strength in handling light and shadow, as he contrasts luminous mauve-tinted shade with the warm late-afternoon sunshine washing across the land and lighting up the clouds.